This book ticks so many boxes for me. David Bowie was the first "serious" artist I discovered as a teenager; I have known and loved all (well, most) of his seventies albums for as long as I have really loved music. 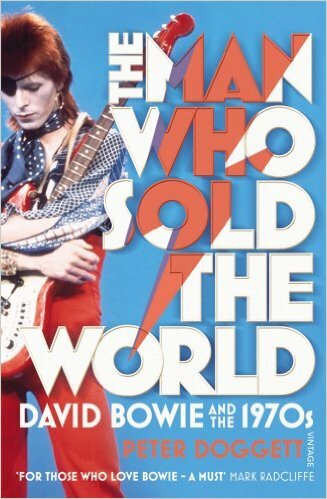 Plus Revolution In The Head, to which this is explicitly a sequel/homage (apparently the late Ian MacDonald was intending to give the same treatment to Bowie as he had The Beatles), is one of my favourite books about music. If that wasn't enough, Peter Doggett wrote the fascinating You Never Give Me Your Money. And given its structure - essentially, short essays about every song - it should be perfect for dipping into whenever there is a spare moment. Despite all those good things, I struggled with it, and I'm not entirely sure why. The structure doesn't help actually; there's no easy flow through the book since it's always stopping and starting - I found the same with Revolution In The Head, if I'm honest. I also realised that there are larger parts of Bowie's seventies output that I am unfamiliar with than I thought (particularly Pin Ups, 'Heroes' and Lodger), so the discussions of those songs didn't engage me much. However, where TMWSTW differs the most from the Beatles' book is that while MacDonald gives lots of interesting facts about the music (personnel, instrumentation, keys etc), Doggett concentrates on interpreting the words. I've said before that I don't listen to lyrics much. It's pop music, not pop poetry. I understand that it's much easier to write about what is said than what is not said; as the famous quote goes, "Writing about music is like dancing about architecture". Nevertheless, it's incumbent on any music journalist to make the attempt, and while Doggett does so sometimes, it's not a particularly good or informed analysis. He admits in his introduction that he can't claim the same level of musical knowledge as MacDonald (a "trained musicologist", apparently) and so paid more attention to other aspects - to the detriment of the book, in my opinion. I learned many things about David Bowie I didn't already know and it served me as a reasonable substitute for a biography (I find them pretty dull usually). It also gave me some interesting things to think about next time I listen to the albums. What it failed to do - and this is the fundamental test for any writing about music - is make me want to rush back and hear them again with new ears. And so on those grounds it must be judged as less than a success.